Ricky Gervais’ bittersweet comedy-drama Derek returns to Netflix with the one-hour Derek Special! Netflix will make the special available exclusively to its members in the U.S., Canada, Latin America, France, Germany, Austria, Switzerland, the Nordics and Benelux on Friday April 3, 2015 at 12:01am PT. Seasons 1 and 2 of “Derek” are currently streaming. 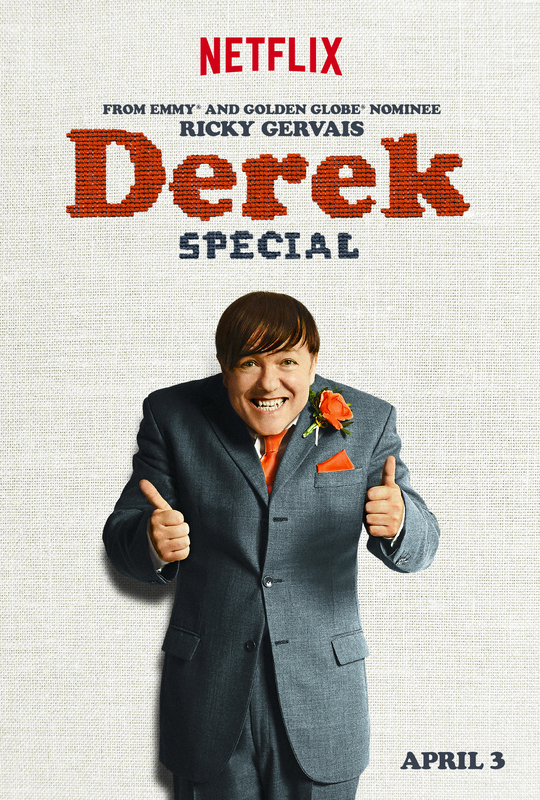 Derek, for which Gervais was nominated for an Emmy and a Golden Globe for his leading role, centers around Derek Noakes (Gervais), a tender, innocent man whose love for his job at a retirement home shines through. Derek cares deeply for the home’s residents, because they are kind and funny and tell him stories of what life used to be like. Among those in his life are Kev (David Earl), a lovable train wreck who lives with Derek and spends most of his time lazing around the home; and Hannah (Kerry Godliman), a care worker in the home and Derek’s best friend. She is smart, witty and hard-working, and, like Derek, always puts other people first. In the Derek Special, Tom (Brett Goldstein) has a new job, which allows him to spend more time with Hannah. Will this allow their relationship to flourish? Derek is upset with Hannah for upsetting Kevin, who goes missing, whilst Vicky takes on more responsibilities.